Hello! We are Michael Quinn Patton, Founder and CEO of Utilization-Focused Evaluation and Katherine Haugh, Monitoring, Evaluation, Research, and Learning (MERL) Associate at USAID LEARN. As evaluators, we know that learning from evaluation occurs when the process is rooted in partnership and is accommodating to different learning styles. That’s why we collaborated to share key findings from Michael’s recently published book, Facilitating Evaluation in a creative and engaging way. 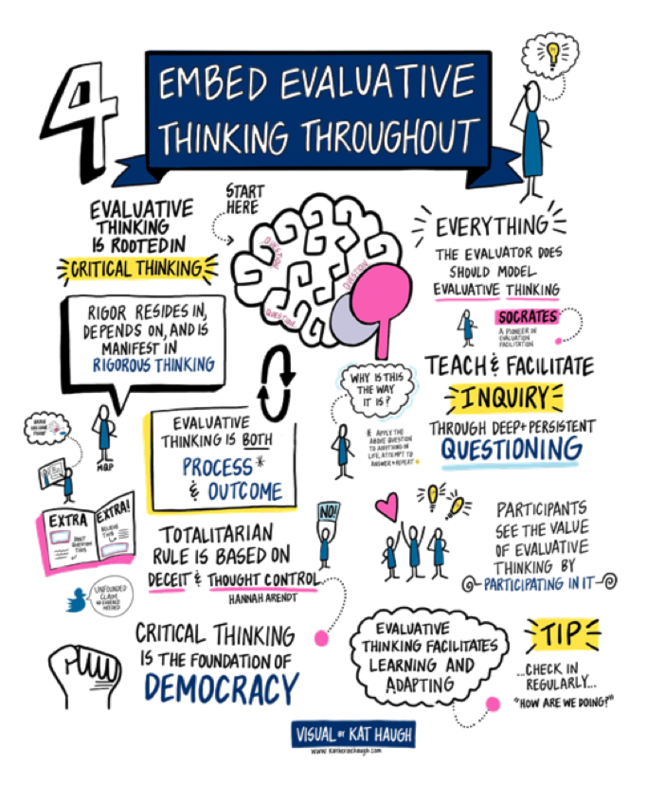 For the visual learners out there, take a look at the visual below which recaps chapter four of Michael’s book about facilitating evaluation. If you’re curious, check out the full set of visuals from the book. For the auditory learners out there, tune in to this MQP podcast which includes a conversation between Michael and me about Michael’s reflections on the book. For tactile learners, take a look at some of the experiential learning techniques Michael describes in his book (a few of which are mentioned below). Learn about the people you’ll be facilitating. The personal factor is the single most important determinant of what impact an evaluation will have. Be fascinated by people and their stories; learn about what drives them and what they feel committed to. Let the people you are facilitating experience you as a person, not as someone filling a role. Be more than just an evaluator. At the stage of choosing methods, especially, be more than just an evaluator. Be a technical advisor, a consultant, a teacher, and an advocate for quality. Treat everything that happens during the facilitation as data. Be mindful throughout the entire facilitation. Observe, interpret, adapt. This includes all formal and informal interactions (i.e. during break times). Don’t forget to observe yourself as a facilitator, too! Teach and facilitate inquiry through deep and persistent questioning. Everything you do during the facilitation should model evaluative thinking. Evaluative thinking is both process and outcome. Participants see the value of evaluative thinking by participating in it. Connect the conversation to larger trends, movements, and emerging research. Groups feel inspired when they see their local and national work as part of a global movement. Global challenges, like climate change and multinational capitalism, know no boundaries. That’s why it’s imperative to think globally, act globally, and evaluate globally. Get your copy of Michael’s new book, Facilitating Evaluation. See more examples of how graphic recording can be used as an evaluation tool. Be more than just an evaluator. The process of reviewing your steps is critical for an evaluator, I believe crucially when teaching assessment and building capabilities. Very attractive the devices shown in the text.